It will include: 1 table 3/4" wide x 1-1/2" long x 5/8" tall, 2 styles of chairs 4 in all ( Wood is 3/4" tall x 3/8" wide x 3/8" to seat- Bone is 3/4" tall x 9/16" wide x 7/16" to seat, 1 candle 5/8" tall X 3/16" round-base tapers to1/4" round, bones,( Fred the floor skeleton is 1-1/2" long 1/4" tall, but can be scattered- 13 pieces) , 1 banner icon with bat 3/4" round x 3/16" thick, 1 Skull Cauldron 1/2" round x 3/8" tall, 4 tombstones 11/16" tall x 3/8" wide, and 1 count sleeping quarters. Casket measures 1-5/8" long x 1" wide tapers to 3/8" x 1/2" thick. 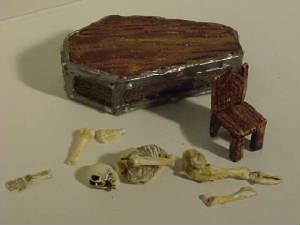 A vampire could sink his teeth into this stuff.One of the chairs designs is almost all bones! The casket is plain, but can be customized with your own icons. Notice the table legs are carved skulls. You can do all sorts of things with this set. Here is Fred the floor skeleton. I am still working on his left arm and feet. If you need a few things for a dungeon then get ready. From here down I will be adding a few things for that. My first addition will be Wall Bones. A customer in California requested it, and I made it for her. Wall bones is a 15 piece model that can be posed. I posed him looking up at a window in this one, but you can glue on the skull however you want. You get 1 set of chains, 1 skull, 1 ribcage, 1 set of arms( hands are different ), 1 set of legs, 1 set of shin bones,1 set of feet, and 3 spider webs. 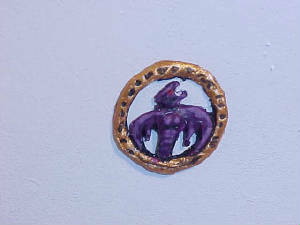 This bat icon would look good on a banner. Even glue it to the counts casket for detail. The Elf is from hasslefree-see link page for him. 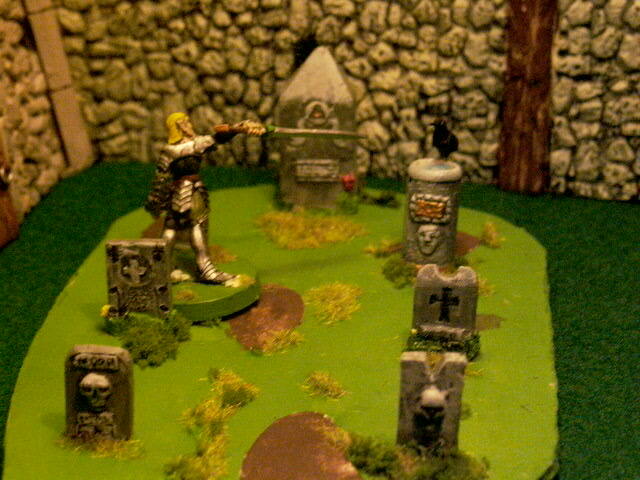 Gravestone kit includes 8 grave markers, and one large old crow. This kit can add a little more to your graveyard, or maybe start a new one. Either way it is full of detail down to the crows feathers. Not all grave markers are in this picture.